CAMERA was honoured to be commissioned by Aardman to provide motion capture for 11-11: Memories Retold. 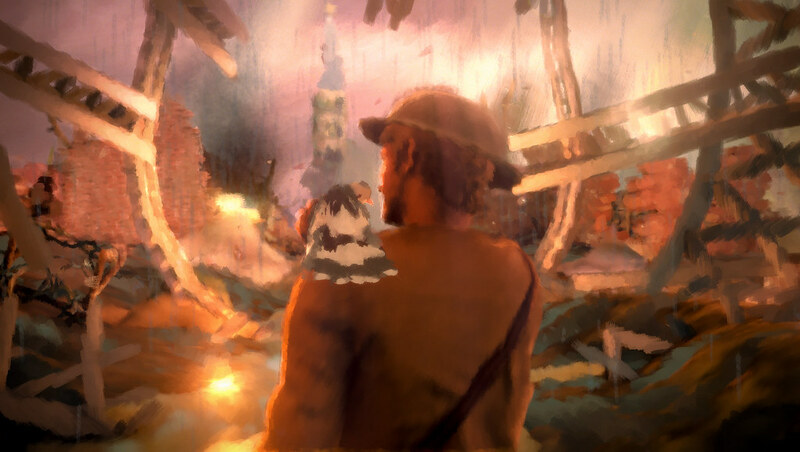 Aardman has collaborated with BANDAI NAMCO Entertainment Europe and DigixArt to create 11-11: MEMORIES RETOLD, a story-driven narrative adventure set during World War I with a unique painted style that plans to deliver an entertaining experience unlike anything before. The Aardman team spent nearly two weeks with researchers in the CAMERA Studio over the course of nine individual shoots to get the motion capture data they needed to animate most of the major characters in 11:11. The capture sessions were delivered using CAMERA’s Vicon system, and involved two performers, Chris Brown and Alison Garner, along with a selection of props including a rifle and even a stuffed cat. For each shoot the CAMERA team would attach 50 passive optical markers to the performer’s motion capture suit. The cameras then track the position of those markers in space to create a skeleton that is used to animate a digital avatar. Real-time pre-visualisation, or pre-vis, is a method of showing live how the motion data that the performer is generating looks on the character avatar. It uses a pipeline taking the motion data into the game engine Unity where it is applied to the character in real time to give a ‘rough’ version of what of the final outputs will look like. Pre-vis was used during shoots to help the Aardman team direct the performer and make decisions about how the shots should be done. We also had input during the shoots from the lead animator based out in Singapore, who was able to watch the performance in the studio via video link. In total CAMERA delivered around 8000 character seconds of body motion capture data for the project. The project gave opportunities to local performing arts talent, with Bristol Old Vic Theatre School student, Jyuddah Muzahura, volunteering to perform in the initial test shoots. The project was a fantastic experience for the whole CAMERA team and we hope to work with Aardman again in the future. The story-driven adventure set in World War I will be available on November 9th, 2018, on PlayStation®4, Xbox One and PC. In 11-11: MEMORIES RETOLD, Kurt, Harry and their animal companions are the main protagonists. Voice talent from multi award winning actor Elijah Wood and International Emmy Award nominated Sebastian Koch will bring the characters of this moving adventure to life.